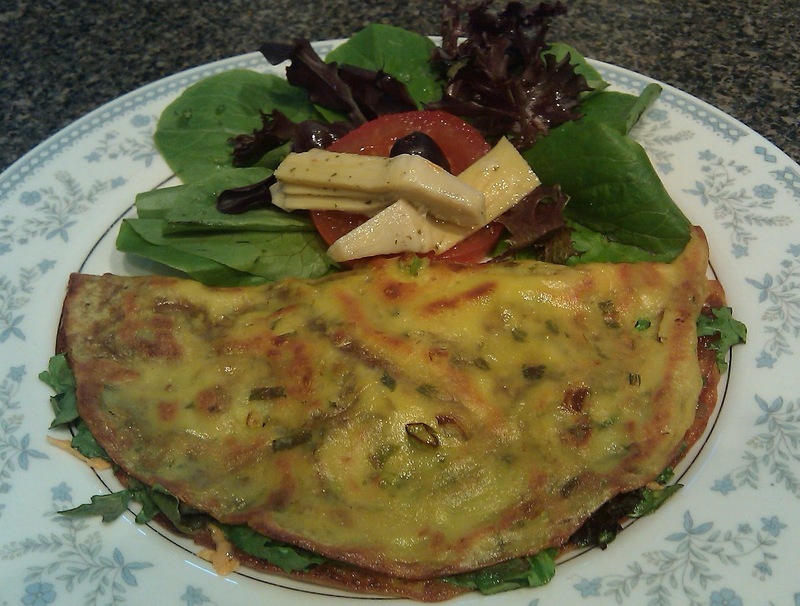 VEGAN OMELET – BACK BY POPULAR DEMAND! 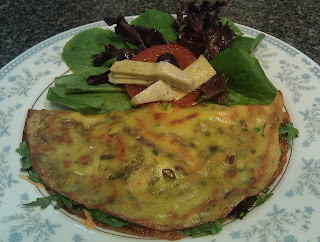 I have been asked over and over for the recipe for my eggless omelet. I love the puzzled look I get when I tell people that I make an eggless omelet! What in the world are you putting in this dish? Since I don’t like dishes that are too complicated to make, these omelets are easy to prepare and keep in the fridge for up to a week. They are the thin kind. So make a batch, refrigerate it and whenever you feel like it, voilà! By the way, they are great for brunch, lunch and dinner. TIPS: If you have made the batter ahead of time and refrigerated it, make sure to take it out 30mn before you need to make it otherwise the batter will be too thick and you will end up making pancakes! Not that pancakes are bad or anything, but you will miss the light texture of this exquisite dish. Another important thing I had to learn this the hard way, is resist the urge to flip the omelet until it is lose in the pan (this may take 1-3mn depending on the heat and the pan you are using), otherwise it will break and you will have something that resembles more a scramble than an omelet! If you are making these for several people, make them ahead of time and keep them in the oven until it is time to serve them. Make an extra one, just in case, because, the chance of someone asking for seconds is almost guaranteed! You can eat them just like that or add a filling. You can use a mix of shredded vegetable, vegan meats, cheese, get creative and let me know how it turned out! Measure 2 cups of unbleached flour with 1 cup of rice flour, 2 tsp turmeric powder, 1 tsp salt and mix with 2 cups of coconut milk and a little water. If too thick, add a little water and make sure there are no lumps. Cook one laddle at a time in an oiled skillet at medium heat. Fill with onions, mushrooms, any vegetables you like. What I love about this dish is that because it is made of flour (instead of the usual egg mixture), you do not need to eat bread with it. You feel satisfied and energized for many hours just with this one dish and little salad on the side.